Most of the hats I’ve come across are just basic hats. In Canada (or any colder climate), I’ve found that basic hats don’t always cut it. There’s something extra about a hat with ear flaps – your ears stay warm and being able to tie it under your chin keeps the wind out just that much more effectively. 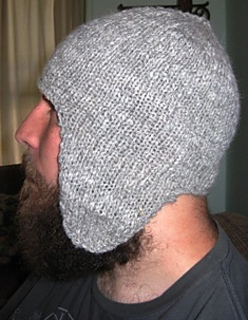 When I started knitting, I couldn’t find a pattern for an ear flap hat that I really liked. I experimented and made a bunch for friends. This basic pattern is the result of that experimentation. Enjoy! I like my hats a bit longer so that the ear flaps cover right down to my jaw line (they keep the wind out better in cold winters), so keep that in mind when using my guidelines. As always, adjust to your tastes. 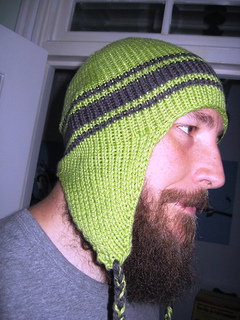 Edit - pattern updated January 23, 2010 to correct minor errors during brim assembly (pdf v1.2).